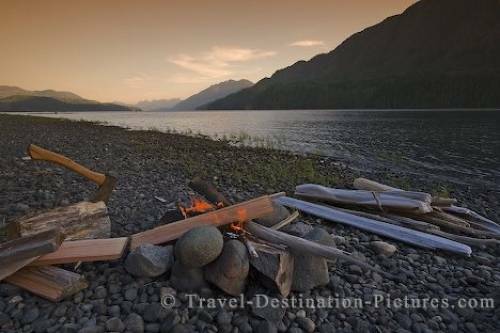 Nimpkish Lake is a great camping vacation destination on Northern Vancouver Island, British Columbia, Canada. Back from a two day trip on a boat out on Johnstone Strait and Knight Inlet we relaxed one evening having a barbecue on the shores of Nimpkish lake on Vancouver Island, British Columbia, Canada. Picture of Nimpkish Lake during sunset on Vancouver Island, British Columbia, Canada.